The Martin J. Whitman School of Management’s H.H. Franklin Center for Supply Chain Management hosted its annual Salzberg Memorial Lecture Program on Oct. 19. Established in 1949, the annual Salzberg event is a central component of Whitman’s Franklin Center, which is consistently recognized among the best in the country by leading publications and organizations. During the event, industry executives from leading corporations share insights into trends, advancements and innovation in the fields of SCM, transportation and logistics. 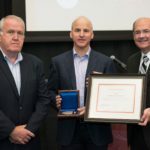 The Salzberg Medallion is acknowledged as one of the most prestigious awards in the field of transportation and supply chain management—in part because of the caliber of past honorees and in part because of the program’s rigorous selection process. 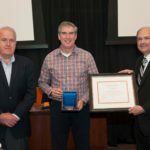 Paul Charrette, senior director of operations, accepted the award on behalf of the company. Charrette’s presentation offered insight into Google’s unique supply chain. Mountz is the founder of Kiva Systems, Inc. Mountz talked about the founding of Kiva which later became the basis for a new division of Amazon, Amazon Robotics. Tang is a distinguished professor at the Anderson School of Management, UCLA. Tang spoke about the role supply chain plays in social responsibility and the importance that information transparency can have in areas such as agricultural productivity. Michael Dominy, vice president of research at Gartner, gave the keynote address on how supply chain must adapt to a new digital world. 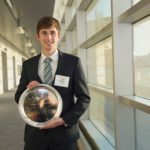 During the event, Todd Joseph Phillips ’18 of the Whitman School was presented the Zinsmeister Award for excellence in supply chain management. The award was established by Joanne Zinsmeister-Yarwood in memory of her husband. 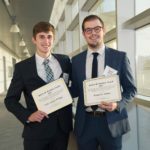 Phillips also received the Robert H. Brethen Prize, along with Rafael M. Molina ’18. This award is given to outstanding students studying supply chain management. The event concluded with a virtual reality demonstration and dinner. Paul Charrette accepting the Salzberg Award for Google. Mick Mountz (center) being presented his award. 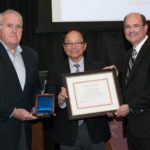 Dr. Christopher Tang (center) receiving his award. Todd Joseph Phillips ’18 (left) and Rafael M. Molina ’18 (right) with their awards. 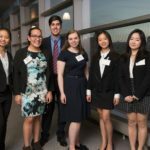 The Whitman School student presenters.